Gaff rig is a sailing rig (configuration of sails, mast and stays) in which the sail is four-cornered, fore-and-aft rigged, controlled at its peak and, usually, its entire head by a spar (pole) called the gaff. Because of the size and shape of the sail, a gaff rig will have running backstays rather than permanent backstays. The gaff enables a fore and aft sail to be four sided, rather than triangular. A gaff rig typically carries 25 percent more sail than an equivalent bermudian rig for a given hull design. A sail hoisted from a gaff is called a gaff-rigged (or, less commonly, gaff rigged or gaffrigged) sail. Gaff rig remains the most popular fore-aft rig for schooner and barquentine mainsails and other course sails, and spanker sails on a square rigged vessel are always gaff rigged. 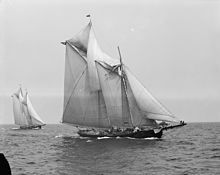 On other rigs, particularly the sloop, ketch and yawl, gaff rigged sails were once common but have now been largely replaced by the Bermuda rig sail, which, in addition to being simpler than the gaff rig, usually allows vessels to sail closer to the direction from which the wind is blowing (i.e. "closer to the wind"). The throat halyard hoists the throat of the sail (the end closer to the mast) at the forward end of the gaff and bears the main weight of the sail and the tension of the luff. The peak halyard lifts aft end of the gaff and bears the leech tension. Small craft attach the peak halyard to the gaff with a wire span with eyes at both ends looped around the gaff and held in place with small wooden chocks, larger craft have more than one span. Peak halyards pull upwards, approaching the gaff at right angles. Additionally, a gaff vang may be fitted. It is a line attached to the end of the gaff which prevents the gaff from sagging downwind. 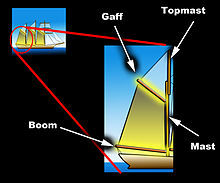 Gaff vangs are difficult to rig on the aft-most sail, so are typically only found on schooners or ketches, and then only on the foresail or mainsail. A triangular fore-and-aft sail called a jib-headed topsail may be carried between the gaff and the mast. Gunter-rigged boats are similar, smaller vessels on which a spar (commonly, but incorrectly called the gaff) is raised until it is nearly vertical, parallel to the mast and close adjacent to it. Topsails are never carried on gunter rigs. The Spritsail is another rig with a four-sided fore-aft sail. Unlike the gaff rig where the head hangs from a spar along its edge, this rig supports the leech of the sail by means of a spar named a sprit. The forward end of the sprit is attached to the mast but bisects the face of the sail, with the after end of the sprit attaching to the peak and/or the clew of the sail. For a given sail area a gaff rig has a shorter mast than a bermudian rig. In short-ended craft with full body, heavy displacement and moderate ballast ratio, it is difficult to set enough sail area in the bermudian rig without a mast of excessive height and a center of effort (CE) too high for the limited stability of the hull. Because of its low aspect ratio, the gaff rig is less prone to stalling if oversheeted than something taller and narrower. Whilst reaching, the CE being set further back, will encourage a small craft to bear up into the wind, i.e. strong weather helm. The boat builder can compensate for this at design stage, e.g. by shifting the keel slightly aft, or having two jibs to counter the effect. The gaff-cutter is in fact a very popular sailplan for small craft. The helmsman can reduce weather helm significantly, simply by sheeting out the mainsail. Sheeting out may appear to create an inefficient belly in the sail, but it is often a pragmatic alternative to having a heavy helm. A swing keel lifted halfway is the perfect treatment for weather helm on a gaffer. The usual adjustments to mast rake, or even bowsprit length may be made to a gaffer with persistent heavy weather (or lee) helm. On a gaff-rigged vessel, any heading where the wind is within 20 degrees of dead aft is considered a run. When running with a gaff-rig, the CE of the mainsail may actually be overboard of the hull, in a stiff wind the craft may want to broach. Running goose winged with a balloon staysail poled out to windward will balance the CE; Nick Skeates circumnavigated Wylo II with this configuration. In light winds, or when racing, a watersail may also be set. 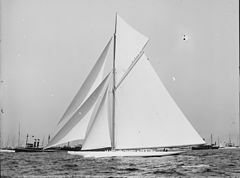 Gaff rigged Cutter Partridge 1885. 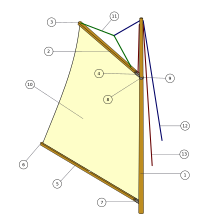 Wikimedia Commons has media related to Gaff rigged sails. ^ "The Gaff Rig Page". Archived from the original on December 3, 2008. Retrieved 2008-10-05. ^ Philips-Birt, Douglas (1954). Rigs and Rigging of Yachts. W&J Mackay & Co. Ltd. p. 176. ^ "N-gram comparison of 'gaff-rigged', 'gaff rigged', 'gaffrigged', 1900–2008". Google books Ngram Viewer. Google Inc. Retrieved 17 February 2013. ^ Cunliffe, Tom (1992). Hand, Reef and Steer. London: Adlard Coles Nautical. p. 12. ^ Leather, John (2001). The Gaff Rig Handbook: History, Design, Techniques, Developments (2nd ed.). WoodenBoat Books. p. 32. ISBN 978-0-937822-67-8. ^ Leather (2001), p. 33. ^ Leather (2001), p. 54. ^ Philips-Birt (1954), pp. 47–48. ^ Cunliffe (1992), p. 15. ^ Cunliffe (1992), p. 118. ^ Cunliffe (1992), p. 120. Rousmaniere, John (1998). The Illustrated Dictionary of Boating Terms: 2,000 Essential Terms for Sailors & Powerboaters. W.W. Norton. ISBN 978-0-393-04649-6. This page was last edited on 6 December 2018, at 13:06 (UTC).